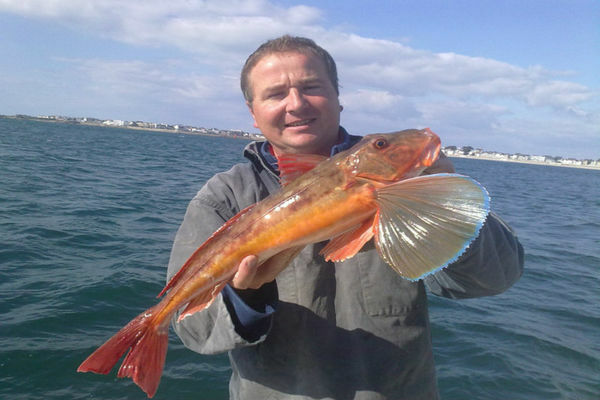 During the winter Bruno Roulet is a professional fisherman, and from April to September he offers trips out to sea and fishing excursions. He'll show you how to find all the coastal species and also take you further out to find sharks. 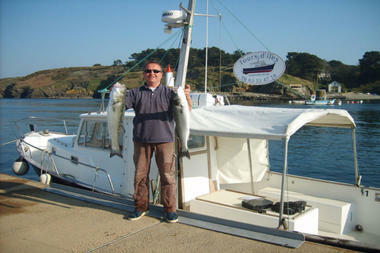 Bruno Roulet operates from Belle-Île and Quiberon, offering fishing trips and boat trips to the islands of Houat and Hoëdic from mid-April to the end of September. Born and bred in Morbihan, he works as a professional fisherman during the winter and has a motorboat that gives him greater scope than just fishing the coastal waters for sea bass, pollock, mackerel, etc. In fact, contrary to what most people think, there are sharks in the seas off Brittany. In August he heads further out to sea to focus on big-game fishing and looking for blue sharks. He can take up to nine passengers. "Last year, my biggest catch was a 50 kg fish measuring 2.2 metres," Bruno recalls. "But we always release sharks back into the sea." Fishing takes place whilst at anchor in the deep water around the islands, and the trips are suitable for everybody.